This page provides a summary of the parking policy. All faculty, staff and students must register their cars. Due to limited space, JPCatholic strongly discourages students from bringing cars to campus and each student is only allowed one car. Residential and commuter students must purchase a Parking Permit for their cars for $35/quarter. Beginning Fall 2013 - residential students will be charged $200/quarter to park at Latitude, which includes the $35/ quarter fee. Grand Avenue between Centre City and Kalmia. S. Maple Street between Grand and 3rd. Broadway between Valley Parkway and 3rd. City parking lots, including the lot bordered by Maple and Valley Parkway, and the lot bordered by Maple and 2nd. Staff working in the Administration buildings (200 and 220 W Grand Ave) may park in the building parking lots. 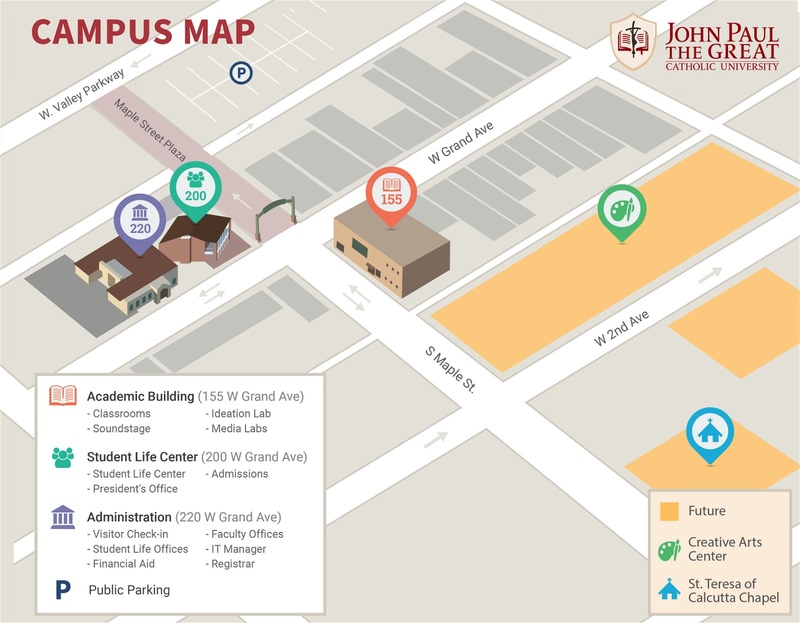 Faculty may park in designated spaces in the Faculty Building at 220 W. Grand Ave.
Commuters: JPCatholic has an agreement with the City of Escondido to provided 50 reserved spaces during the hours of 8:00 am and 5:00 pm, Monday thru Friday in the city lot on the corner of Escondido Avenue and Woodward Avenue. After these hours, you may park in that parking lot but the spaces are no longer reserved specifically for JPCatholic. All gate openers/fobs must be rented from JPCatholic. Gate openers are NOT available from the Latitude 33 leasing office. Garage openers require a $100 deposit, which will be returned when the remote is returned. You will be assigned a parking space or garage and you must park in that spot. Overnight parking is not permitted by students or guests in the Rite Aid or Movie Theatre parking lots near Latitude33. 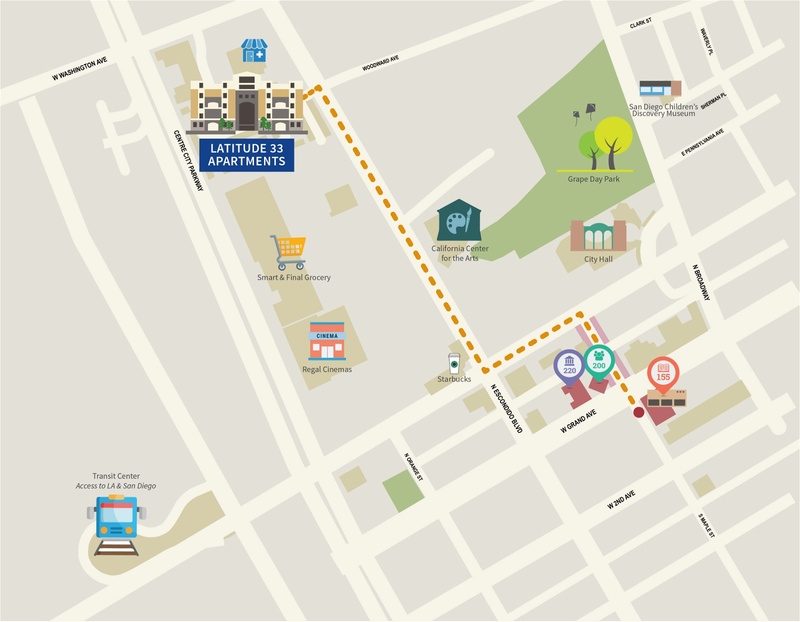 While most students do not take public transportation, the JPCatholic apartments and classroom complex are well served by public bus. View the Breeze 351 and 352 Schedulefor frequent service from the apartments to the classroom complex. View the Breeze 350 Schedule for frequent service to: St Mary's, North County Fair Mall and to connect with Bus 20 to downtown San Diego. View the Sprinter light rail Schedule for frequent service from the Escondido Transit Center to Oceanside (the beach), and connects to Amtrak, the Los Angeles Metrolink with service to downtown Los Angeles, Hollywood and LAX and the Coaster with service to downtown San Diego.